Aedin 2019-04-12 Christine the assistant was excellent. Thanks. Ethan 2019-04-09 Ashleigh served me and was very friendly! Great customer service and fantastic prices. Elaine mc mullen 2019-04-07 Very satisfied with the actual shop and retail assistants.. they were so helpful.. however, I did end up buying sandals and one of which was on display and is noticeably different to the one that hasn’t been on display.. I really do think that when you pay £75 for your product or it doesn’t matter the cost you should receive an unused pair of sandals but if it is on display then a small discount should be on offer..
Our store in Belfast is located on the busy shopping street of Royal Avenue. We have a huge range of brands to suit all tastes including Nike, Converse, Vans and many more. 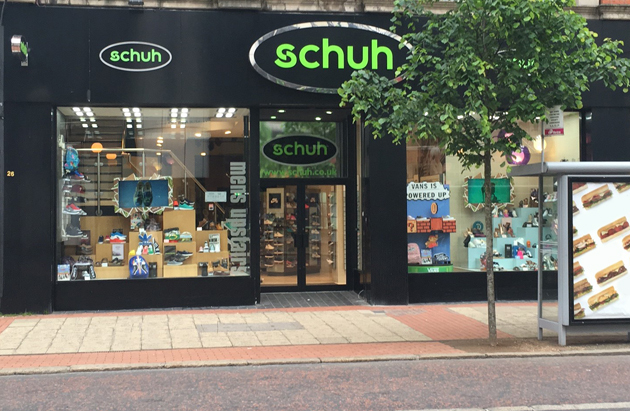 Whether you're a lover of trainers or looking for the perfect pair of heels, you're sure to find something here at schuh. We also offer a great selection of kids shoes so your little ones can be on trend with you too!